Matt and I went to see the Padres host the New York Yankees today. The AWMA San Diego Chapter, my environmental professionals organization, had a tailgate party before the game. They grill hamburgers and hot dogs out in the parking lot for a few hours before the game. 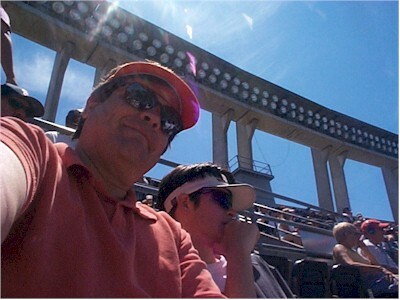 For the game, we sat in the third row of the upper deck (now called the "View Level") on this bright, hot, sunny day. It was so hot, we left at the 7th inning stretch with the Yanks leading 2-0. Turns out the Padres tied it in the bottom of the seventh, then lost 3-2. This is the second time the Yankees have been in town. They visited here in 1998 for a couple of World Series games.